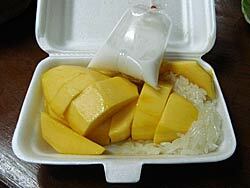 Another great food treat that you can find at Thong Lo (Sukhumvit Soi 55) is White Sticky Rice with Mangoes. My last blog on March 18 was on Thong Lo Duck Noodles; here’s one more blog on a Thong Lo stop. Thong Lo (pronounced “Tawng Law”) has its own skytrain stop. Kasma puts her small-group tours at a hotel there close to the mouth of the Soi. I’ve also written on its street food in One Soi’s Street Food Scene. I’ve enjoyed the chance to get to know one particular Thai neighborhood a bit better. Although Thong Lo is considered an upscale area, there are plenty of store fronts and street vendors that depend on un-trendy people (such as myself) to keep them in business. One very strong candidate for “Favorite Thai Dish of All Time” would have to be Coconut-Flavored Sticky Rice with Mangoes – Kao Niow Ma-muang. When Kasma teaches it in her cooking classes (week 3 of the beginning series) it is one dish that seldom has any leftovers! There’s a store on Thong Lo that does a very good version that you can purchase to go. 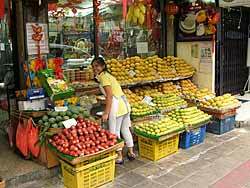 It’s “Ma Varee Fruits Store” and is the first fruit store you come to as you walk from the skytrain down Thong Lo (on the same side as the sky train exits). You’ll recognize it by the display of mangoes in front. 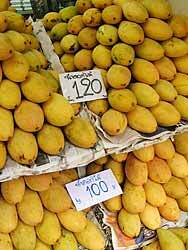 A quick word on Thai mangoes. They are heavenly. 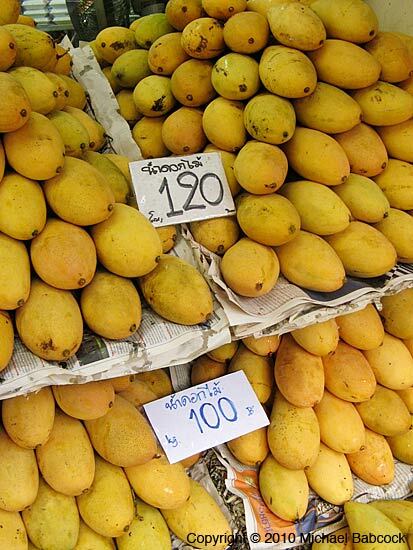 Mind you, I’ve never been in Thailand during the actual mango season when they are at their peak. Nevertheless, the ones I have eaten bear no resemblance to anything we get in the San Francisco Bay Area. My favorites are the yellow ones; even off-season when you get a good one, it melts in your mouth with sweetness – an “ah ha!” taste experience. Add the sticky rice, mixed with delicious, rich (fresh) coconut milk, slightly sweetened, and you have ambrosia. Kasma’s recipe for Coconut-Flavored Sticky Rice with Mangoes (Kao Niow Ma-muang). This entry was posted on Sunday, April 4th, 2010 at 12:05 am	and is filed under Food, Markets. You can follow any responses to this entry through the RSS 2.0 feed. You can leave a response, or trackback from your own site. You’re right on the money when it comes to mango’s flavor. I haven’t had any good tasting mangoes since I’ve been here. Some of the best tasting mangoes, picked at the peak of maturity, can’t survive the long trip to the US.